Saamrus lies in a woodland valley between a tranquil stream and the foothills of the ancient Magaliesberg mountains. Each cottage is fenced off and offers a private braai area. All of the cottages have fireplaces, ceiling fans and wall heaters for added comfort in both summer and winter. We provide pet-friendly, private, fully-equipped, self-catering cottages. At Saamrus you will find wide, open views as well as indigenous woodland and veld. There are easy walks along the river and more adventurous hikes across the hills. It is a paradise for bird watchers and nature photographers. -Please pay at least a 50% deposit into the following account within 12 hours to confirm your booking. -For last minute bookings, less than 7 days before arrival, 100% of the booking amount must be paid within 12 hours to secure the booking. -The balance is payable at least 3 days before arrival via internet payment or credit card.... -Please pay at least a 50% deposit into the following account within 12 hours to confirm your booking. -The balance is payable at least 3 days before arrival via internet payment or credit card. -The staff has strict instructions not to hand over the keys should there still be an outstanding balance. -If you forgot to pay electronically, please settle the balance in cash on arrival before booking into your unit. -The staff will supply you with a receipt. -Booking in: Not earlier than 14:00 and not later than 20:00. -Booking out: Not later than 10:00 unless otherwise arranged. -Please note that the last 1,5km to Saamrus is a narrow farm road. The first section is paved and fine for all vehicles, but the second half of the road can be slippery and difficult for low cars in wet weather. In spite of this, the road is still accessible by car, but if you come with a very low, sporty car, you will find it quite difficult. You should not get stuck, but you will have to drive very slowly if you are coming by car to prevent you car hooking at the bottom. -If you are bringing pets along, please make sure that they are thoroughly treated against ticks. During summer, they will definitely pick up ticks when walking in the veld. -Extra day visitors (not sleeping over), are only allowed if arranged with management in advance. There is a charge of R100 per person for day visitors. -Cottages are not normally serviced during your stay. Servicing can be requested at an extra charge of R50 per service for two people (more for group bookings). Please confirm this upon arrival. -Piet-my-vrou, Kiepersol, Suikerbos, Akasia, Karee and Olienhout cottages are situated on a steep hill and only reachable by diff lock bakkie,4 x 4 or on foot. (in wet weather serious 4 x 4 or on foot only). If you have a car only and wish to stay in this cottage, you can park your car at the safe reception parking area at the foot of the hill and walk the 60 - 400m uphill to the cottages. We will have at least 2 strong men on duty to help you carry the luggage for a tip of R20 each on arrival and departure. 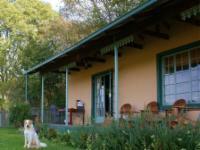 -Tarentaal, Kiewiet and Hoephoep cottages are situated at the foot of the hill and close to the river walks. These cottages are reachable by car. The kettle was filthy to say the least but the lady who greeted us brought me a different kettle. To be honest I do not think we would visit Saamrus again. Very pleased we were in Hoephoep and not Kiewiet or Tarentaal. Lovely environment for the dogs. What a wonderful spot. Peaceful and quiet with excellent walks for the dogs and great stoep and view for the people. We loved it and we will be going back soon, it was everything we needed. Thanks for looking after us so well. Thank you so much, we enjoyed our stay. And so did our two four-legged companions! We didnt want to come home. The unit was very clean and well equipped. Will definitely come visit again. Thanks guys! Facilities were OK. I did not get the rooms I booked. Got a lesser equiped room, but still had to pay the same price.The road to the facility is extremely bad. The sign at the entrance is not visible at night and only faces one direction. I drove passed the entrance atleast 3 times. Even though I phoned the owners several times. At one point both their cellphones were on voice mail, frustrating me a lot as I was still lost. It's the second time we've been here and will come again. Even though we had water pressure and leak problems, you guys sorted it and kept us in the picture, and that's what client service is all about. 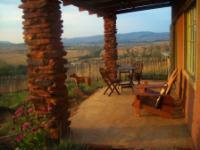 Saamrus Guest Farm is 6km from the centre of Magaliesburg , the nearest airport 45.6km (Lanseria International Airport).